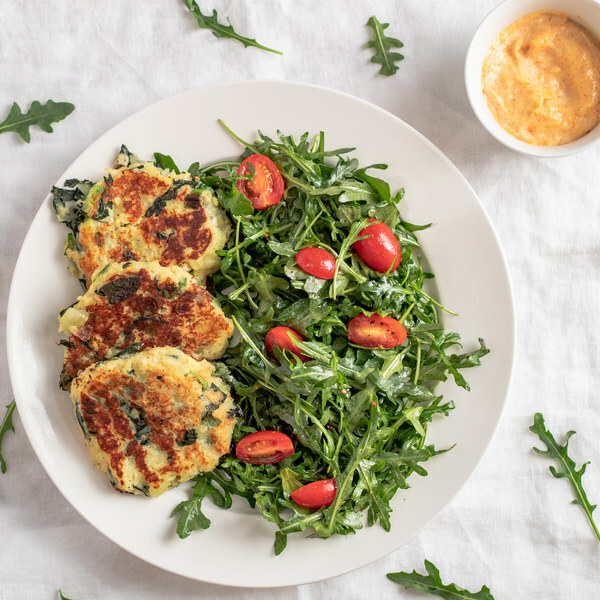 ← Kale-Potato Cakes with Lemon Aioli & Arugula Salad. Peel and chop the potatoes into 1-inch cubes; peel and smash the garlic (press firmly with the flat side of a knife or bottom of a pot). Place the potatoes and garlic in a medium saucepan, season with salt, and cover with water. Cover with a lid and place on the stove at high heat; bring the water to a boil. Fold leaves of kale in half lengthwise and slice off the stems. Chop or tear leaves into bite-sized pieces. When the potato water comes to a boil, uncover, turn down to medium, and cook until potatoes are almost done, 8 minutes. Add kale to the pot and cook 2 minutes more. Meanwhile, grate the zest from the lemons and transfer to a small bowl, then juice the lemons into a large salad bowl. Add oil, maple syrup, Dijon, salt, and pepper to the salad bowl with the lemon juice; whisk to combine the dressing. Halve the grape tomatoes and add them to the bowl with the dressing. Chop green onions into ¼-inch pieces, set aside. Using a potato masher or fork, mash potato and kale until almost smooth, with a few small chunks remaining. Add bread crumbs, cheese, egg, green onions, Dijon, salt, and pepper; stir to combine. Meanwhile, add mayonaise, garlic powder, and paprika to the small bowl with the lemon zest and mix to make the aioli. Once the skillet is hot add oil. Using a ⅓ measuring cup for each cake, drop potato mixture into the pan, pressing to make ½-inch thick rounds. Cook 3 minutes on each side, until crisp and golden; set aside. Cook in batches if necessary. Toss arugula with salad dressing and tomatoes. To serve, divide potato cakes and salad between plates. Serve with aioli and enjoy!